“Capitalism and Natural Law Life, Liberty, and Private Property” from Christian Faith Publishing author Robert N. McGrath, Ph.D. is an informative method that shows the philosophy behind the modern “free enterprise” system and the ties to Christianity. 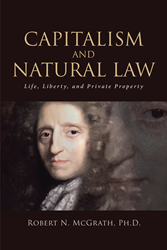 “Capitalism and Natural Law Life, Liberty, and Private Property”: an enlightening approach to show that Capitalism and the modern economic structure have found advocates and opposers for the economic laws being “Natural” or faith directed. “Capitalism and Natural Law Life, Liberty, and Private Property” is the creation of published author, Robert N. McGrath, Ph.D., an United States Air Force Veteran, with a background in the aerospace industry as a logistician, engineer and manager for a variety of world known scientific companies, including Texas Instruments and General Electric. By the end of the cold war, Robert earned several master’s degrees and his Ph.D. in business administration. The areas of professional focus were strategic, project, technology and innovation, as well as, operations management. Published by Christian Faith Publishing, Robert N. McGrath, Ph.D.’s new book brilliantly gives tantalizing information without a conclusive answer, in order to allow the reader to make the final elucidations on what they deem to be acceptable conclusion. View a synopsis of “Capitalism and Natural Law Life, Liberty, and Private Property” on YouTube. Consumers can purchase“Capitalism and Natural Law Life, Liberty, and Private Property” at traditional brick & mortar bookstores, or online at Amazon.com, Apple iTunes store, or Barnes and Noble. For additional information or inquiries about “Life, Liberty, and Private Property”, contact the Christian Faith Publishing media department at 866-554-0919.